When you need attention-getting circulars and inserts, we’ll make people take notice. 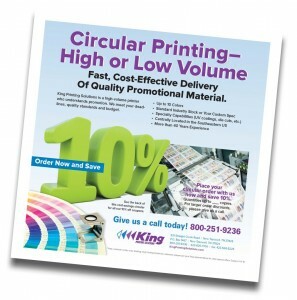 King Printing Solutions is a specialist in high quality, high-volume printing. And our presses are ideally suited for newspaper inserts and circulars. We can provide prompt turnaround on your orders so you meet deadlines, and our 40 years of printing experience mean you get accurate colors and vivid precision. So promotional message gets noticed, even when mixed in with some of the biggest retail brands in the nation. Place your circular order with us now and save 10%* on quantities of 1 million or more. For smaller order discounts, please give us a call at 800-251-9236.